The gravel-surfaced property at Glen Raven Logistics in Altamahaw, NC takes daily abuse from tractor-trailer trucks coming for fuel and maintenance. The heavy loads and turning tires from multi-ton vehicles running over the same pathways each day had created ruts that filled with pooling water and was showing signs of progressive failure. Adding additional aggregate fill in the ruts helped for a short time, but soon the ruts reappeared. How could facility managers create a flat, stable lot when concrete was beyond budget? Strata provided the answer. Strata's engineering department recommended a combination of StrataBase and StrataWeb. 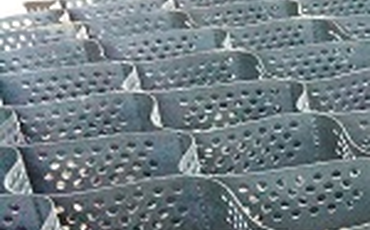 StrataBase is a rigid biaxial geogrid that provides structural reinforcement for roads and parking areas. StrataWeb is a three-dimensional honeycomb geocell that provides soil confinement throughout the full depth of the product. The two products work together to provide a stiff base course that can withstand heavy load without significant deformation. The StrataBase provides sub-grade stabilization and spreads the weight of the heavy load over a large area. The StrataWeb provides confinement of the compacted base course preventing future displacement and base course disturbance common with turning of loaded tractor-trailer trucks. After the design was completed, the team contracted with B&H Grading of Elon, NC to excavate the 5,000 square foot area to a 6-inch depth. Storm drainage was already in place and the slope was maintained. The StrataBase (SB11) was placed over the area with a 12“ overlap. StrataBase provides biaxial tensile reinforcement increasing the sub-grade bearing capacity and providing load support. Next, 4“ depth StrataWeb medium-sized geocell was placed and filled with the excavated material and crusher run mix. This process confined the soil, increased the surface stiffness and increased resistance to the displacement of the gravel surface. After the geocells were filled the area was then compacted and graded back to original elevations and topped with a 2-inch layer of 3/4' clean stone. The solution proved to be successful. Glen Raven Logistics now enjoys a level parking lot that withstands the heavy truck traffic with no ruts, pooling, or continual maintenance. The team achieved this at about 50% less than the cost associated with a concrete pavement solution. Trucks can now come and go for maintenance, repairs and refueling with ease.